Here is Nechville’s special wish for the new year and beyond. We hope that you will be encouraged to make music a priority in 2015 and support the work of the Banjo Revolution. First the “Banjo Revolution” obviously refers to the one-piece revolving flange on the modern Helical Mounted banjos. 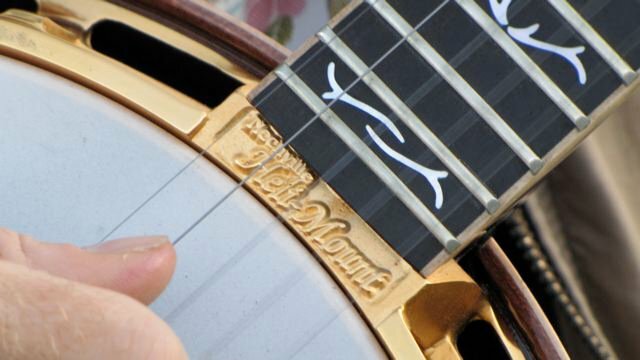 When Nechville entered the professional luthier business, no one was really asking for a better banjo. However, our instinctive understanding of the instrument gained from many years of obsessive study, emboldened us to put forth some radical redesigns that we felt had the potential take this traditional American instrument to the center stages of popular music. During our three decades of banjo “rebellion”, the revolving Heli-mount design has caught on with top performers, grassroots players and music lovers across the globe. In addition to hailing our “Revolutionary” banjo design improvements, the pun intimates a reverence for what our forefathers fought for, i.e., freedom of expression. The banjo originally came to us in the freedom songs of slaves. Its unmistakable sound echoes of America’s trials and triumphs through its history and remains a sound of freedom to this day. Today the freedom to create a future for oneself; to pursue happiness, is considered the central benefit of being a free human being. In my personal example, with the full support of my loving wife and family, my once imaginary career of designing banjos is now in full bloom. Similarly for your life; if you have a musical vision and play your way toward it, you will get there. The joyful phenomenon of making music that our banjos were designed for should be among everyone’s life goals. It will spread a friendly revolution of musical experience, and good times for all. The “Banjo Revolution” slogan therefore invites all of humanity to discover the creative spirit such as that which guides our hands in making music. Musical collaboration, especially that involving bluegrass music, opens new social channels and connects people of diverse origins in fun family-friendly festivities. Personal bonds won through music can influence the world significantly for all of us. The hope behind the Banjo Revolution, therefore is social revolution; when a major segment of our population embraces bluegrass-inspired music. The ultimate victory for the Revolution will be when our lawmakers and powerful money-moguls develop a commitment to spreading work to everyone while lessening the burdens on themselves and others, with the goal of creating more leisure hours for everyone. The Banjo Revolution describes a lifestyle choice based on relationship building through homegrown music among friends and family worldwide. Mankind has lived for thousands of years without cars, planes and computers, but with the explosion of time saving technology and mechanization, we should have discovered how to redeem benefit from the fruits of our ingenuity to arrive at a better balance between work and play. Happily our work satisfies much of my creative desire, but I still struggle to find that ideal balance. Unfortunately, artistic pursuits such as learning the banjo are completely off the radar by those over-stressed by full-time jobs and basic lifestyle responsibilities. Let’s encourage people from all walks of life to take time for the challenge and camaraderie of learning music together. The Banjo Revolution as a force for positive change can remain forever a fantasy, OR it can instantly become a reality if it sparks a musical fire in your life. Our sincere congratulations if you decide to invest the fruits of your labors in an instrument, or simply decide to turn off the TV to jam with your kids or friends. Banjo has the power to “revolutionize” your life as you experience the true meaning of making beautiful music together.